The Director has sent us a Club Penguin message! that's weird. i haven't gotton that message yet. Please don't put CPG Mod after your name unless you are answering someone's question. Hey Mimo, I just looked up if polar bears hibernate, they don't. This is probably a trick... 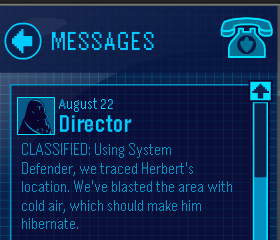 Unless Herbert is a pregnant female, he/she won't hibernate... You dont have to post this but just letting you know. In case you wanna blog about it lol. Wow. No offence, but that sounds a little mean, not you think? Or maybe Herbert is girl and boy!